At 4 p.m. Sunday, Feb. 3, the National Weather service issued a “Winter Storm Warning” for the Riverside County mountains. 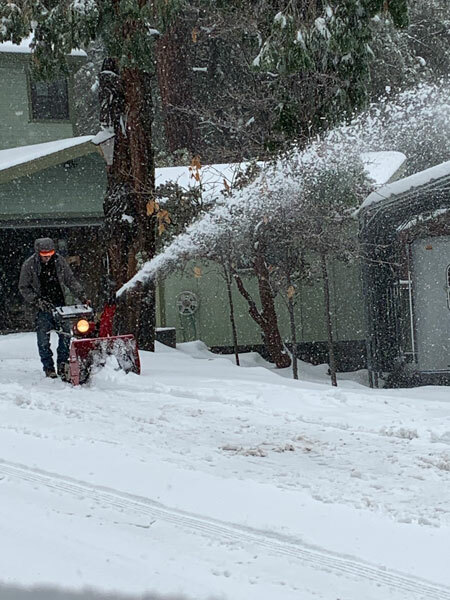 Although no snow or only some snow flurries fell in Idyllwild Sunday night and Monday morning, by early Tuesday morning, the snow had arrived here, too. The cold front arrived Monday afternoon, and the afternoon and night rain showers evolved into snow showers. Monday night and Tuesday, NWS advised “snow levels will drop considerably to the 2,500 and 3,000 foot levels.” By Monday morning, the snow level started at Mountain Center. Snow fall was estimated to be between 3 to 6 inches between 5,000 and 6,000 feet. Tuesday night and above 6,000 feet, accumulations of 8 to 12 inches were likely. A Winter Storm Warning for snow means severe winter weather conditions are occurring. If you must travel, keep an extra flashlight, food and water in your vehicle in case of an emergency. Monday morning after several days of rain, Strawberry Creek was flowing very strongly. While there may be several feet of snow at Mt. San Jacinto peak and the Hill above 7,000 foot elevation is pure white, rather than its natural green and brown, Idyllwild and lower remain drenched but by Tuesday morning, it was no longer snowless. As of Monday morning, the Forest Service’s Keenwild Ranger Station recorded 4.5 inches since noon Thursday, Jan. 31. Nearly 2.5 inches of that rain fell from Saturday through Monday and more was expected until Wednesday morning, when the sun is supposed to return. Rains began Friday when the atmospheric river passed over Southern California. From Oct. 1 to Jan. 31, Keenwild recorded 10.5 inches of rain. The long-term historic average for that period is 11.8 inches. 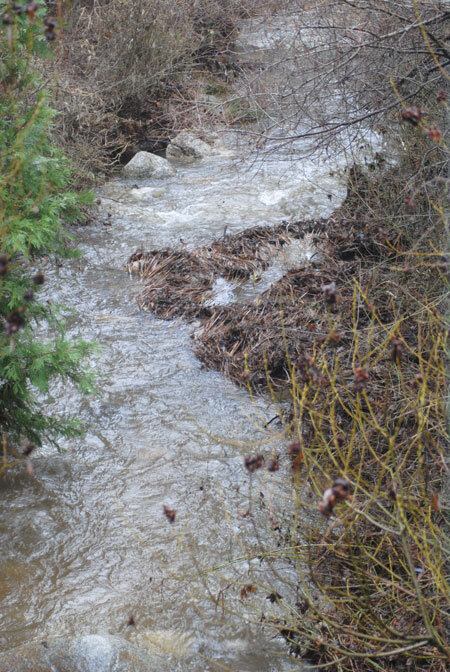 As of Tuesday morning, Feb. 5, Keenwild has recorded nearly 14.2 inches of rain. Historically, February brings about another 4.5 inches of rain. Since Feb. 1, 3.7 inches have fallen. During these rain storms, Vista Grande has received about 5.5 inches and Thomas Mountain about 2.1 inches. Last week, California’s Department of Water Resources conducted its second snow survey of 2019 and reported, “Statewide, the sierra snowpack is 100 percent of average.” In 2018, the second survey was only 14 percent of average.